Chasin’ speed demons! 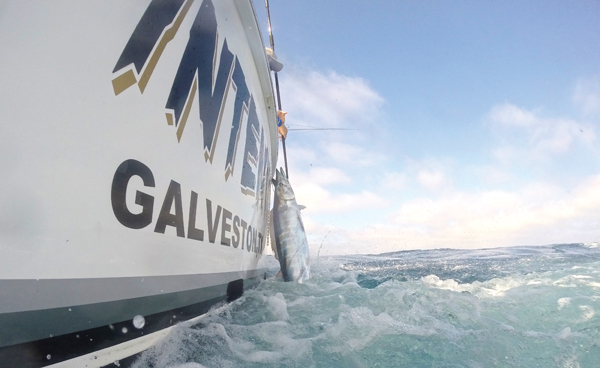 Flower Garden Banks wahoo photography and GoPro video from onboard Bad Intentions, a 64′ Viking Sportfisher out of Galveston, TX. A winter wahoo, one of the fastest fish in the sea, about to come to a complete stop. The battle comes to an end. Ron McDowell watches his wahoo hit the deck. 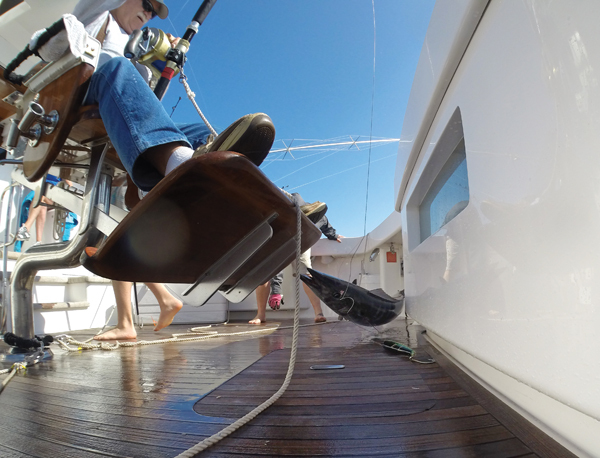 A wahoo bares its teeth as the gaff moves into position. Skirted ballyhoo was a productive bait on this trip. Debbie Conway reels in an early morning wahoo at the Flower Garden Banks on Feb. 9, 2015. David Weiss Jr. waits with the gaff, deckhand Tatum Frey clears the cockpit while Ron McDowell observes the fight and Capt. Billy Wright maneuvers the boat. A hefty wahoo ascends into the boat. This fish bit a dark colored Braid Marauder. Look for dorado under weed mats and floating debris. 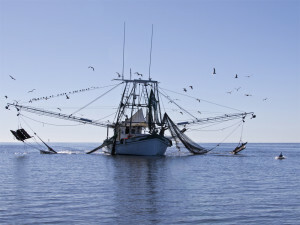 Shrimp boats can inspire a frenzy of fish activity. 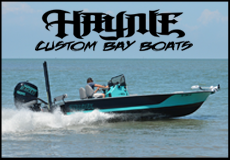 There are many anglers with boats capable of making offshore trips during periods of good weather; however, a large percentage of them are apprehensive about venturing beyond the jetties. July and August probably are the two best months of the year for the smaller boats to make a Texas offshore fishing trip. Barring an event in the Gulf, the weather is the most stable of the year and the winds tend to be lighter on average than most months. 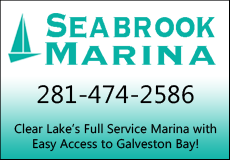 Just about every pelagic fish that visits the Texas Coast is within easy range of smaller boats with limited fuel capacity during July and August. The conditions are good and the fish are there, so what is keeping you from making that first trip to battle a king mackerel, ling, Spanish mackerel, shark or Dorado? For me, it was a lack of information on where to go, how to fish and what equipment would be needed. Sure, the big boys with boats over 30 feet in length knew all of that stuff; however, for us bay fishermen with smaller boats we just did not know a king fish rig from a bottom rig. In sharing some of my first experiences and frustrations with you, it is hoped that you will learn some of the basics of offshore fishing and, if your boat is suitable for a run of 10 to 15 miles out, you will give it a try. 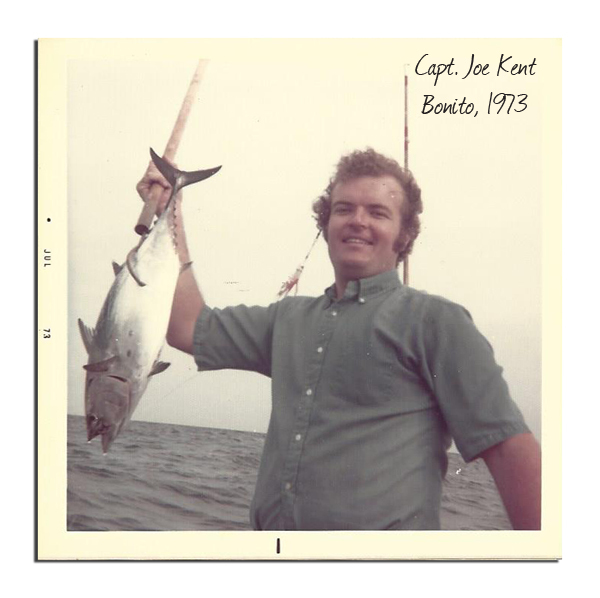 My first trip into the new world of offshore fishing came in late June of 1972. The first big issue was preparing my boat for the trip. We had all of the safety equipment required and a C.B. Radio for so-called ship to shore communication. Several extra six-gallon tanks of gas were on board and we had a good compass. Extra water was carried along and a good first aid kit. While all of that was necessary, the one thing we did not think about was extra anchor rope. Anchoring in 50 to 70 feet of water requires much more rope than at 12-foot depths. Our biggest mistake was in the fishing equipment we chose. Our tackle was too heavy. We took “broom-stick” rods equipped with large reels filled with 80-pound test line. After all we were fishing offshore and the fish are big and require heavy equipment. That is not the case for the near shore waters. Bait and riggings were the next big mistake. We only had bottom rigs typically used for red snapper and squid and cut mullet were the baits we brought along. When we anchored at a spot 10 miles out of Freeport called the Middle Bank, other small boats were fishing there also, some trolling others anchored. 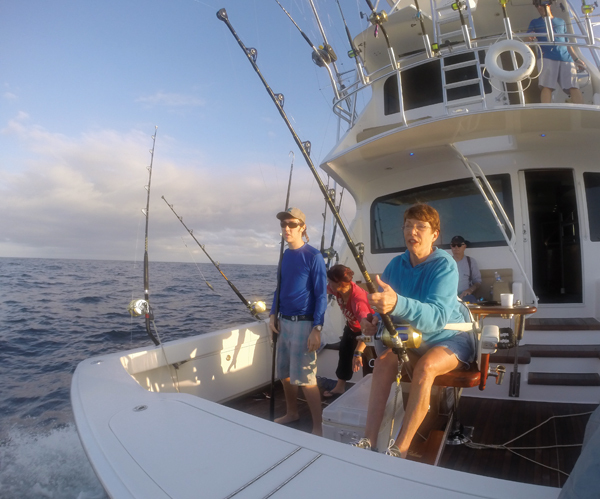 We were close enough to other boats that we could see their fish and all were having a field day catching kings, bonito and sharks. Our bottom rigs produced hard heads, small snapper and lot of other bottom feeders. Little did we know that the action came from baits floating near the surface? After that trip we started becoming knowledgeable about how to fish offshore and here are some tips to help you with your first trip. First and foremost is safety. Keep a close eye on the weather and if potentially threatening conditions are in the forecast, reschedule your trip. There are a lot of days during July and August that are excellent for heading offshore in a smaller boat. Next equally as important is the condition of your boat. Regardless of size, is it seaworthy, does it have the proper safety equipment and fuel capacity? As a general rule you should carry 30 percent more fuel than you estimate using for your trip. Type I PFDs are a must also. Now, let’s concentrate on the fishing. If you have not been offshore before, it is quite different from inshore fishing. A good trout rod will suffice if the reel can handle 20 to 30-pound test line. Kingfish are common offshore. Drift a ribbonfish or sardine rigged on a wire leader to find them. Wire and coated wire leaders with either single 6/0 to 8/0 hooks baited with fin fish or two to three hooks for ribbon fish are needed. Weights are used only if the current is so strong that the bait stays on top of the water. Ideally the baits consisting of sardines, ice fish, cigar minnows or ribbon fish should be suspended just below the surface. A gaff and a club are needed as a landing net will not work for kings and many other surface fish. Areas within 10 to 12 miles that are best for newcomers are the wells and platforms. One of the best ways to fish them is to motor up to the platform and drop your baited line overboard. As your boat drifts away, the bait will stay just below the surface. Be prepared for a vicious hit as kings and other surface fish don’t nibble but usually strike hard at your bait. When you gaff your fish, use a club or other blunt instrument to stun the fish by hitting it in the head. This makes it easier to place the fish in the ice chest and avoids your catch flopping around on the floor of the boat and avoids damage to your equipment. From mid-July on, anchored shrimp boats also are excellent spots to drift using the same technique as drifting surface structure. Once you get a trip or two under your belt, other techniques will surface such as trolling baits or bottom fishing. 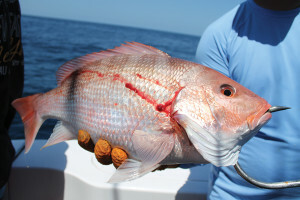 For the first trip or two, stick to drift fishing wells, platforms and anchored shrimp boats as other methods and techniques will catch your attention as you progress in offshore fishing. July and August are the top months for offshore fishing off of the Texas Coast and each year when calm conditions set in during the Dog Days of Summer, the urge hits to try offshore fishing. With the numerous days with high pressure settling in resulting in light winds and low probabilities of severe weather, small boaters give-in to the urge to venture beyond the jetties. 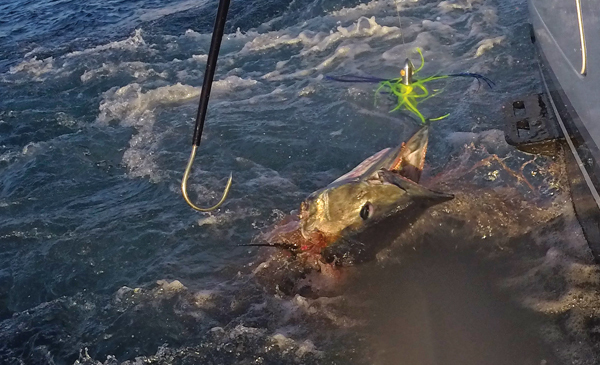 This time of year varieties of pelagic fish are roaming the waters of the Gulf of Mexico within easy reach of the “Mosquito Fleet” of smaller sea-worthy boats. If you are one of the many newcomers to offshore fishing in this manner, let’s discuss some of the most common mistakes made by those new to the scene. While this might not be one of the common mistakes, the Cardinal Rule for all captains is to check the weather forecast before departing and to keep monitoring it. A book easily could be written on all of this; however, for purposes of our discussion, we will divide this topic into two segments, the boat and the fishing and address some of the key mistakes. Fuel: Fuel use for an offshore trip is going to be much greater than for most bay and other inshore trips. Carry at least 30% more fuel than you estimate you will use. 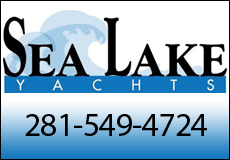 Float Plan: Before leaving dock have a float plan, meaning a compass course from the jetties, an estimate of how far you will travel, the estimated time of return to dock and leave it with someone who will be the first to realize you are late returning. Most of all stick with your plan. 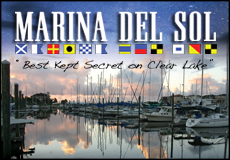 Communication: Carry your cell phone fully charged with the number of the marina or bait camp you departed from, the coast guard and sheriff’s offices. If possible have a VHF or Citizens Band Radio with you. Navigation equipment: A good quality compass is a must. A GPS system, either hand held or permanently mounted, is close behind in the pecking order. Shade: Shade is important on the open water. The length of the trips is usually much longer which means longer exposure to the overhead sun. Any shade will be welcomed after a few hours of the sun beating down upon you. Extra provisions: Take along much more water than you estimate you will drink. If mechanical problems crop up, it likely will take a good length of time before help arrives. Often disabled boats float overnight before being located and towed to shore. For the same reason, a more complete first aid kit is needed. Flares: Flares are not required for many inshore boats; however, for running offshore they not only are necessary, but required by the regulations. Life jackets: Life jackets called PFD’s (personal flotation devices) are required. While lesser grade PFD’s are allowed by law, offshore boats should carry type I PFD’s. They are the best and keep an unconscious person’s head above water. Along with the life jackets should be some light rope to use in the event the boat capsizes and several people are afloat in PFD’s. Tying each together with several feet of rope will prevent the group from separating. One of the rules in rescue is “bigger is better” meaning a cluster of life jackets are easier to spot than just one. The Penn 309 and Shimano TLD25 are both sturdy, affordable reel options for first timers offshore. The biggest mistakes made by newcomers offshore are in the size of equipment, the lack of proper accessories and poor knowledge of Federal Fishing Regulations. Too light and too heavy describe most of the problems with rod and reels. The equipment should be designed for the type of fish you are after. Medium weight tackle is normally plenty for the pelagic fish, which are king mackerel, ling, Dorado, shark, barracuda and others. 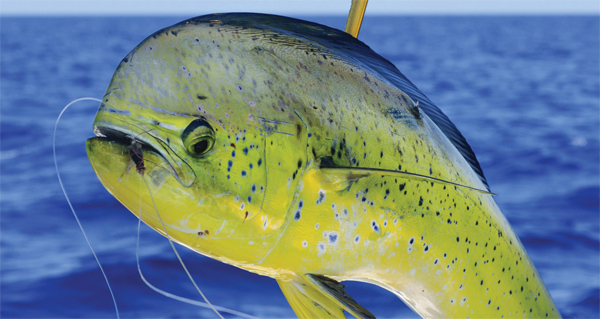 Heavier tackle is needed for bottom fishing for reef fish such as snapper, grouper, triggerfish and others. Normally when fishing bottom, it is necessary to bring the fish to surface quickly and heavier tackle is required. For surface fish, the drag on your reel is a key element to a successful landing. Twenty- pound test line and a little heavier are all that is normally needed for runs up to 40 miles out. Wire and coated wire leaders are necessary for the pelagic fish while heavy monofilament is suitable for bottom rigs. Circle hooks are required while fishing for reef fish. A gaff and club are vital equipment. 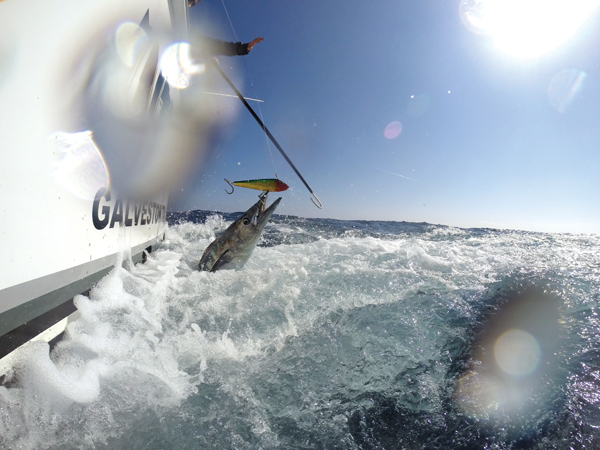 Most pelagic fish are gaffed and then clubbed (hit hard on the head) before bringing them into the boat. Landing nets are fine for smaller fish; however, for the really large ones, a gaff is required. Recently added to the list of required items in a boat fishing offshore are venting and hook-releasing devices. Larger hooks and weights are required offshore. Trout tackle (except for possibly the rod and reel with heavier line) will not be enough. The preference of size of hook varies among fisherman however for the conventional J-hooks, the size is usually within the 5/0 to 8/0 range for drifting and trolling and circle hooks in the 6/0 to 12/0 range for reef and bottom fishing. The size of weights are determined by the strength of the current. The idea is to use the smallest weight necessary to get the bait to the bottom quickly. A ¾ ounce weight might work one day while the next it could take six ounces or greater. All of this will develop with experience. 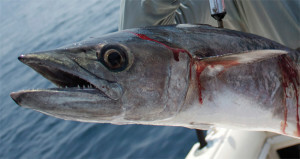 Techniques differ from inshore fishing when fishing for pelagic fish. 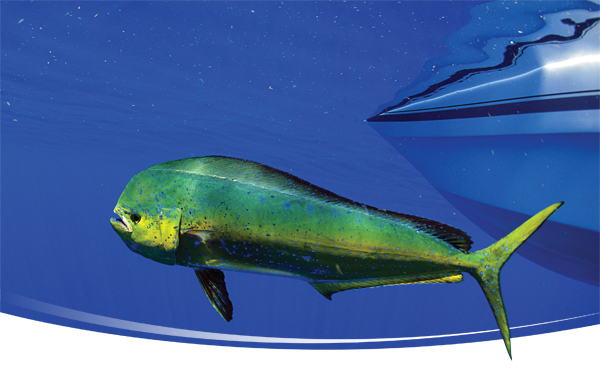 Drifting baits along the surface or just below and trolling both artificials and natural baits are the two main techniques for the pelagics. Watch the setting on your drag, as most newcomers set it too strong and the sudden strike is more than the line strength can handle. The Federal Fishing Rules are more complex and confusing than state rules. Know the bag and size limits for the fish you are after and also if the season is open or closed. If you catch a fish you cannot identify or you are not familiar with the rules governing it, best to release it. Have fun on your first voyage offshore and be safe.